Notice: The Old Ore Road is impassable just south of Ernst Basin, 9.4 miles from the south entrance. The roadway is blocked by an overturned camper vehicle. You may access Ernst Tinaja and La Noria from the south entrance or Willow Tank and Ernst Basin from the north entrance, but vehicles can not drive through or around. The park is working with the owner to remove the vehicle, but this may take a few days. Please check at visitors centers for updates and current conditions on all backcountry roads. It was a jeep-like truck with a camper on it, no trailer! That's a Unimog camper, not a jeep. If you look close, the rear wheels are below the axle centerline. The "pumkin" is offset, where the jeep is centered. Stopped to pee and left the truck in gear. That rig is way too top heavy to be doing OOR. We followed a similar rig out to the north from Roy's Peak Vista, except it was F-350, It was a very impressive sight as it swayed from side to side. On some climbs all the passengers would get out and walk they were so worried about a rollover. They were really really happy when we hit Dagger Flats. I really want this to be what happened. Ok, how about this scenario: Driver going a little too fast hits the rut on the left side of the road. Passenger spits out mouthful of beer out the window as vehicle starts to lean. Vehicle tips over as driver overcorrects. Although I too hope the pee story is accurate. It's a Unimog. 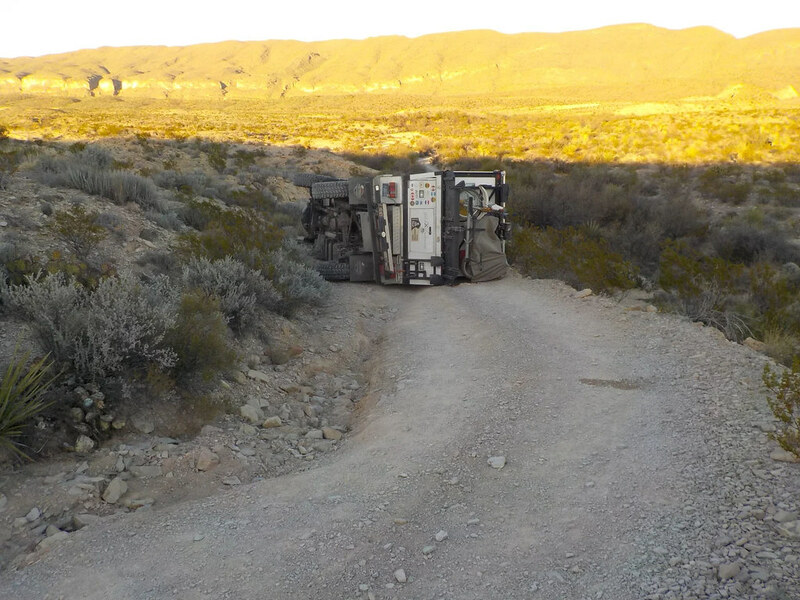 According to what I read on the Texas Overland page on FB, the guy that helped him out thinks he was paying more attention to the passenger side tires and the drivers side dipped into the rut/washout. The driver may have hit the gas and turned the wheel, causing him to tip. There was diesel leaking too. Driver was OK, just shaken up.